Herman J. Kind came to Elgin by the way of Watertown, Wisconsin, where he was born in 1875. After attending public schools in Wisconsin, he attended Northwestern University (what he studied there was not specified, but I assume it was business). Upon completing his studies, he attended The Chidlow Institute of Baking and Milling Technology. David Chidlow, a chemist for the Pillsbury Flour Mills Company, learned so much there that he started his own organization in 1898 called the Chidlow Institute. After Kind completed his education, he worked in Milwaukee for three years. 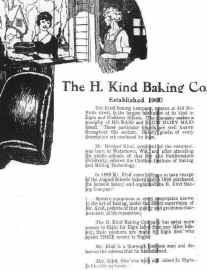 In 1893, Mr. Kind came to Elgin to manage Scheele's Bakery, which he purchased in 1900 and changed the name to the H. Kind Baking Co. The plant shown above was located at 414-420 McBride Street, and produced products such as HO-MAID and ELGIN DAIRY MAID bread. Their advertisements stipulated that they were "Master Bakers and Originators of Specially Baked Products" and boasted a "...Modern Plant--Sanitary Perfect". Elgin Today maintained that Mr. Kind was "...and thorough business man and deserve(s) the success that he has attained".